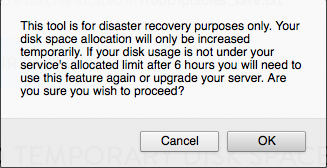 This article outlines the process of adding temporary disk space to your DV server. You can add this space using the Advanced Recovery Tools in your Account Center. Click on the primary domain for your DV service from the Domains menu in the Account Center. 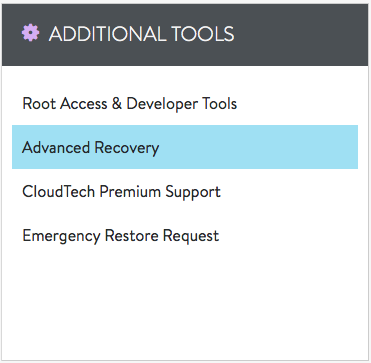 From the Additional Tools menu of the DV Control panel, select Advanced Recovery. Scroll down and click the Add Temporary Space button to continue. Confirm the action after reading the confirmation box. Wait approximately 15 minutes for the new disk space to be added. The page will show a Pending status, and will let you know when the additional space has been added.